Useful accessories, such as LED mirror and shower stool, enable even more comfort and convenience in the bathroom. The illuminated mirrors have all-round LED lighting. The continuous LEDs are arranged behind the satin-finish mirror edge. They enable uniform, glare-free illumination of the face. Warm white light ensures well-being. The light source used enables realistic colour reproduction. 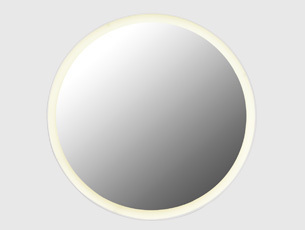 Different shapes are available: A mirror in Soft-Edge design (1000 x 570 mm), a round mirror (diameter 700 mm) and a rectangular variant (680 x 600 mm). As a mobile seat, the shower stools can be used wherever they are needed at the time. They can be used flexibly in the bathroom – for example, at the washbasin. The shower stools have a reduced design so that they fit perfectly into the bathroom ambience. The stools provide support and safety while showering. They have a weight capacity of up to 150 kg. The pleasant surface has a fine texture, to prevent slipping when wet. On the one hand a stool with an ergonomically curved seat is available. The generously designed seat is available in anthracite grey and white. The discrete frame is made of high-quality, chromed metal with a round tubular design. This design also has integrated gripping options, which facilitate sitting down and standing up. The shower stool has an increased seat height of 50 cm, making sitting down and standing up even easier. 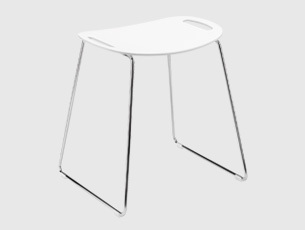 On the other hand a shower stool formed from continuous Plexiglas is available. The stool's design makes it highly stable, even in the wet shower. The seat height is 45 cm. The shower stool is available in matt white.